About 150 West Papuans received their Papua New Guinea citizenship in Kiunga, Western province yesterday after living as refugees for more than 40 years in PNG. 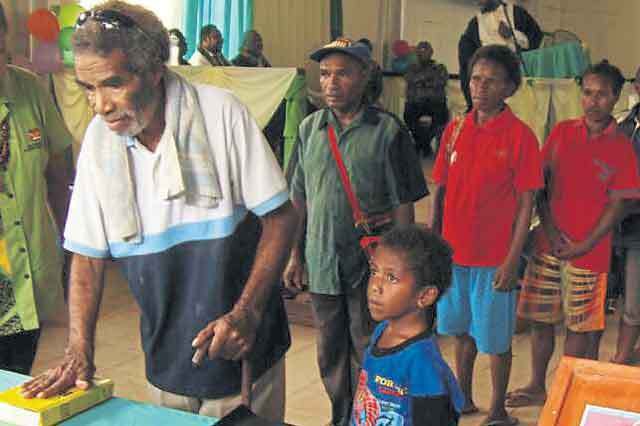 Acting chief migration officer Solomon Kantha said they could now vote in this year’s elections if their names were on the PNG Common Roll. The West Papuans from Indonesia had crossed the PNG-Indonesian border when fleeing political persecution from the Indonesian government. They had fled after the Dutch colonial government had handed over Irian Jaya to the Indonesian government in the early 1960s to become the West Papua province of Indonesia. Citizenship Advisory Committee chairman and Telefomin MP Solan Mirisim said they were able to get their citizenship because the Government in November 2014 announced that West Papuan refuges would not have to pay the required K10,000 citizenship application fees. “These ceremony marks a significant event and the first ceremony that recognise West Papuans who have sought refugees or asylum here in the 1070s and 1980s,” MIrisim said. West Papua is a province of Indonesia. Indonesia claimed the territory of the former Dutch East Indies so it invaded Irian Jaya in 1961. It was agreed in 1969 the UN should oversee a plebiscite of the people in which they would be given two choices: to remain part of Indonesia or to become an independent nation. This vote was referred to as the ‘Act of Free Choice’. But, the vote was conducted by consensus decision-making, or consensus of elders, numbering 1000 of these men had been selected by the Indonesian military.